After years of successfully importing French vehicles to Italy, Cesare Isotta and Vincenzo Fraschini created the Isotta Fraschini Company in 1902. Their elegantly designed automobiles were popular with rich clientele in the rapidly evolving world-wide automobile market. Their creations were reliable, stylish, and quick. An Isotta Fraschini car won the t Targa Florio in 1908. When Isotta Fraschini introduced the Tipo 8 in 1919, the firm had already established itself as the premier builder of luxury automobiles in Italy. Since the dawn of motoring, Isotta Fraschini had offered some of the most pioneering and prestigious examples of the automobile, and the new Tipo 8 would live up to its proud lineage. The Tipo 8 was, the first “production” inline eight-cylinder engine, a design that would the standard for high-performance luxury automobiles of the Classic Era. In 1912 the Isotta Fraschini Company introduced a straight eight-cylinder engine but it would not go into production until 1919 after World War I when the company built aero engines. The eight-cylinder engine powered the Tipo 8, making it the first straight-eight cylinder engine to go into production. The 5.9-liter capacity engine could of produce 100 horsepower, an most noteworthy accomplishment at the time. The grand scale of the Tipo 8 was less essential by the 1920s, when advancements in engineering ensured that a smaller engines were capable of acceptable performance. Nevertheless, in cultivating its image as an exclusive builder of high-end luxury cars, Isotta Fraschini sought to maintain the massive size of its engines and chassis as well as the extravagant coachbuilt bodies to appeal to its very wealthy clientele. A major contributor to the long, stately lines of Isotta Fraschinis was the Tipo 8 chassis itself, with its impressive straight eight necessitating an exceptionally long hood. The coachwork near the scuttle was often aligned with the sizeable radiator, further contributing to the imposing lines and immense stature of the car. The cars were also highly stylized throughout, with many coachbuilders playing up the grand chassis with delightful touches such as intricately detailed brightwork, the finest auxiliary accessories available and bespoke options. In 1924, the Tipo 8 chassis underwent a thorough redesign that improved the overall performance, created a more comfortable ride and helped to facilitate the larger, heavier bodies that were becoming increasingly fashionable by the mid 1920s. Engine capacity was increased to 7.3 liters, giving the vehicle between 110 and 120 horsepower depending on the configuration. The updated design was soon dubbed the Tipo 8A. The standard model sat atop a 145 inch wheelbase while a sportier version was fitted with a 134 inch wheelbase. The North American market was especially important to Isotta Fraschini as many Americans were keen on cars that offered impressive outright performance yet still retained the ability to cruise effortlessly and majestically in the greatest of style. Isotta Fraschini built grand, dignified touring cars that could cruise the continent in speed and style and with surprising ease. At least one-third of 8As were sold in the United States, where the $9,750 chassis exceeded the price of a Duesenberg Model J and a complete coach-built car would cost in excess of $20,000. In 1931, Isotta Fraschini introduced a refined engine with a four-speed gearbox and the name of their car evolved to the Tipo 8B. But as with many businesses, a Great Depression and a Second World War took a toll on the company. The last Isotta Fraschini automobiles were built in 1933. The company shifted focus to creating aero and marine engines during World War II and though several efforts were made to jump-start vehicle production after the conflict, all attempts failed. The factory was forced to close. The unique history of this car is a perfect example of the international appeal and vaunted reputation of the Isotta Fraschini Tipo 8A. Though the chassis was laid down in Milan as early as 1931, it remained incomplete until 1933, the final year of production for Isotta Fraschini automobiles. Castagna, the coachbuilder famous for their beautifully constructed work, bodied this car. The resulting work served as a brilliant expression of its technical and artistic virtuosity. Bodies built by Castagna were of the highest quality and combined the artistic qualities of fine furniture, architecture and industrial design. In creating such decadent bodywork, Ercole Castagna went to some length to ensure a truly international product, which included acquiring licenses to use a Hibbard & Darrin designed hood, Baehr all-weather bodies, as well as French Grebel headlights. The unique two-door, dual cowl sports tourer body fitted to this car is clearly a Castagna product. They were the only Italian firm that could so successfully and coherently combine both decadent and sporting themes in a body of such high quality. The unique body featured stunning, art-deco-style ornamentation on the radiator stone guard depicting the rays of the sun, a rakish V-shaped windscreen, dual cut-down doors, twin rear-mounted spares, torpedo-style running boards and brilliant proportions all contributing to this show-stopping automobile that exudes power, sophistication and good taste. It was such a superb achievement that the car was presented at the 1933 Paris Auto Salon, a venue that always drew the most spectacular and stylish new automobiles. From there it was shipped to the famous Isotta Fraschini showroom in New York for collection by American celebrity Joe Penner, a popular zany radio comedian known to most for his slapstick antics and catchphrase “Wanna buy a duck?” A photograph still exists of this Isotta in Central Park taken upon its arrival in the city. By the 1940s the car had made its way to the West Coast, ending up in the collection of Pacific Auto Rentals, owned and operated by George Schweiger. Schweiger’s collection of approximately 150 cars is notable in that many of the cars were frequently used by the great Hollywood studios and were prominently featured in films of the era. This car had a particularly significant film career, taking a starring role in the 1946 film Without Reservations, starring John Wayne and Collette Colbert. In the film, Wayne and Colbert negotiate the purchase of the car from its beleaguered owner, and can be seen driving it throughout the rest movie, with the Isotta literally serving as the vehicle that drives the story along. The car would later appear in the films Invisible Agent and Mr. Imperium, starring Lana Turner, as well as Follow the Sun: The Ben Hogan Story, serving as an exclusive and imposing mode of transport. It may be best known, however, for its role in the 1956 Warner Bros. epic film Giant, starring James Dean, Elizabeth Taylor and Rock Hudson. Certainly this Isotta Fraschini was the perfect car to illustrate the wealth and power of determined Texas oil baron, Jet Rink, the character played by James Dean who in one scene can be seen speeding along a Texas highway behind the wheel of this car with a landscape of oil derricks pumping in the background. See a compendium of movie clips that feature the car in the RH column here, the link is immediately under the image gallery. The Isotta’s illustrious film career came to an end and the car was completely restored in the late 1960s when it was purchased by Matt Browning of Ogden, Utah. While in the renowned collection of Mr. Browning, the car, by this time restored to its current appearance, was featured in Angelo Tito Anselmi’s definitive book on the marque, Isotta Fraschini. It has since resided in two impressive homes, including the late Otis Chandler’s famed collection, where, for a time, it served as one of the centerpieces of his growing collection of significant classics. In the 1980s the car was comprehensively restored to a much higher standard than the first freshening and, in the possession of its most recent caretaker, the car has benefited from sympathetic cosmetic and mechanical maintenance, ensuring that it remains in excellent order throughout. This Isotta Fraschini is a truly spectacular car in every sense. It possesses a brilliantly engineered chassis, a handsome one-off Castagna body, and an impressive provenance that includes major roles in several classic films and an unblemished history – all of which contribute to a singular and highly desirable classic. This car is sure to continue attracting favorable attention wherever it is shown and deserves its place among the finest coachbuilt luxury cars of the 1930s. A fabulous offering from two of the most cherished names in the history of the Italian automobile industry, this car is sure to please both in the effortless way in which it drives and in its undeniable presence, two characteristics that have gained it much admiration during the past 85 years. 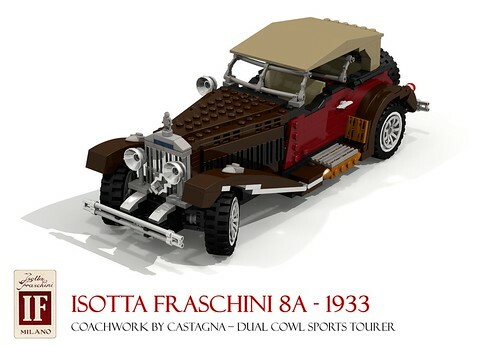 This miniland-scale Lego model Isotta Fraschini 8A Dual-Cowl Sports-Tourer has been designed for Flickr LUGNuts 76th Build Challenge – ‘Viva Italia’ – featuring all things Italian and automotive.